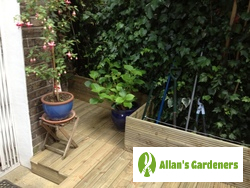 Get garden design services in Sutton North SM1 from a landscaping company that cares. If you’ve just moved into a new property and don’t like the look and feel of your backyard you should give us a call – we’ll help you start from scratch. Begin the process by describing your vision to an expert over the phone and then watch while the team turns it into a reality. Of course, we’re suitable for any one with the time and inclination to make their garden the best it can be. The booking process couldn’t be simpler, and you can get in touch with us at any time. We can't wait to hear from you! 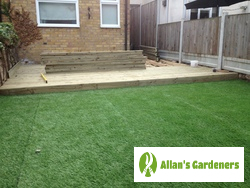 Allan's Sutton North SM1 garden landscapers will arrive on the day of your appointment on time, equipped with all of the tools needed to get the job done and eager to begin work. They’ll take into account your thoughts and will create a plan that uses every inch of space to its best advantage. Whether you want something low maintenance, a specific theme, a garden to delight the senses, or a safe area for your children to enjoy, they’ll have the ideas and designs to make it work. You’re hiring multi-skilled garden landscapers who not only cater to Sutton North SM1 but also… Wembley, Cricklewood, Kennington, Guildford, Wimbledon.